We love the mission of the Rise School and supporting such a beloved institution. 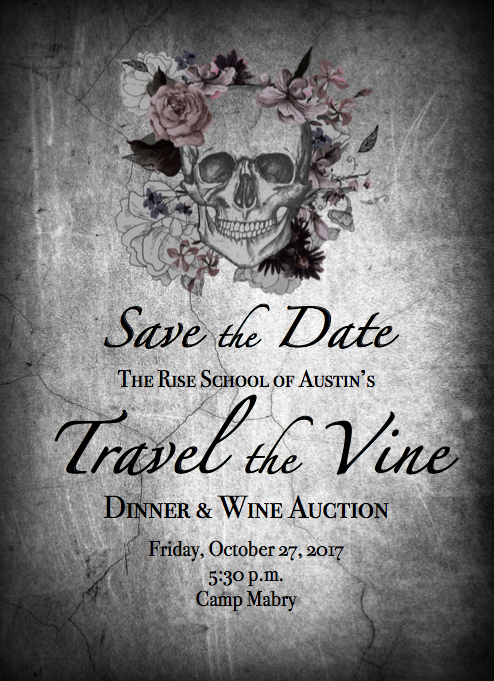 Travel the Vine for Rise is an evening of fine wine, delicious food, entertainment, and a live and silent auction that will benefit the students of The Rise School of Austin. The evening will feature the culinary talents of Chef Eric Nelson Brown from Eat + Drink Austin, winner of Cutthroat Kitchen's “Crabs of Steel," the one and only Cowboy Auctioneer Heath Hale, and the funky rhythm of Matchmaker Band, whose ten incredible musicians will surely have the crowd on its your feet in no time. Travel the Vine's sophisticated gothic ambiance, perfect for the Halloween weekend, will be enhanced by the whimsical designs of Transplant Floral and the moody lighting by Ilios, is the perfect way to kick off your gothic-inspired weekend in style. When: Friday, October 27, 2017; Registration begins at 5:30PM.